In order to tell you what yoga means to me, I have to start from the beginning of my yoga journey. “The science of yoga begins to work on the outermost aspect of the personality, the physical body, which for most people is a practical and familiar starting point.” Indeed, this is where yoga started for me. However, it was not through taking a yogasana class. Instead, I discovered yoga in a much more modern way, through social media. In February 2013, as I was browsing through pictures on the popular mobile application called Instagram, I came across a photo of a beautiful, happy woman doing a handstand on a beautiful beach and I thought to myself, “I want to do a handstand!” At the time, I had no idea that doing handstands had anything to do with yoga or where that one little thought would take me. As I started to try and attempt to do handstands, I began researching different techniques on the internet by watching YouTube tutorials. I discovered one way to get to handstand was through yoga. So, I began teaching myself vinyasa style yoga. As a pilates student of many years, my body awareness is very strong so I was able to quickly learn many different types of poses simply by watching videos and seeing pictures. I started taking an intermediate vinyasa class that taught asana, ujjayi breathing, and breathe connection at one of the many yoga studios in my area and began picking up on sequencing techniques. Before I knew it, I was practicing 60-70 minute vinyasa flows that I made up as I went in the privacy of my own living room. As an introvert, this suited me well. I would attend class once or twice a week and follow the Instagram yogis as they posted tips on different poses. I felt happier, inspired, and more whole than I had felt in a long time. My body loved the physical benefits of the poses as my spine became more flexible, my shoulders and hips became more open, and my hamstrings became suppler. Yoga was still only a physical practice for me. The spiritual aspect of yoga opened up to me three months later, once again, through social media when one of the yogis I followed on Instagram posted a picture of a book describing the yamas and niyamas. This book, The Yamas and Niyamas: Exlpolring Yoga’s Ethical Practice by Debora Adele was my first introduction to the world of yoga outside of asana, a world I had no idea even existed. As I read each page, her words on non-violence, truthfulness, non-stealing, non-excess, non-possessiveness, purity, contentment, self-discipline, self-study, and surrender touched me deeply. In so many ways, I realized that I had been practicing the yamas and niyamas for nearly my entire aware life. I am not a religious person, but a deeply spiritual person and the things I had previously learned in my life through the study of tarot, mindfulness, Wicca, and also innately knew about how to live a peaceful and contented life, were presented together and concisely in this book of the five yamas and five niyamas. I knew I had so much more to learn. I also knew that I had found a practice that I connected deeply with and I wanted to continue to develop this connection to myself. I continued to practice my yogasana diligently, taking one intermediate vinyasa class and a community class at a local yoga clothes shop. During one of these community classes, the teacher ended the class with a very brief discussion on the yoga sutras. I went home and immediately purchased The Yoga Sutras of Patanjali and discovered the true depths of yoga. Yoga was not only about the physical poses, or how we should interact with ourselves and others, there were five other aspects of yoga that would help me live a deeper, more fulfilled life. Within six months of beginning my practice and study of yoga, I knew I wanted to go deeper by attending a teacher training to become a teacher myself. I was first formally introduced to pranayama, the fourth limb of yoga, while I was living in Delhi, India for 6 weeks at the end of 2013. While in Delhi, I was blessed to be able to practice one on one with a yoga teacher three to four times a week. I’ll never forget how difficult it was to re-learn how to breathe correctly. I learned and practiced nadi sodhana (alternate nostril breathing), sitali (cold breath), and kapalbhati (short, strong, rapid breathing). We closed each practice with mantra and chanting. With my teacher in India, I learned how to incorporate pranayama into my already established practice. Admittedly, pranayama is the weakest part of my practice, though I see how it has impacted my daily life. I have noticed that I breathe more naturally now, through my abdomen instead of my chest. I am able to more quickly calm my nerves and anxiety by becoming acutely conscious of my breathing. As I look back at my life, I can see that I have been practicing pranayama for far longer than I realized. As I a child, I would crawl into my mother’s bed when I couldn’t fall asleep and she would tell me to close my eyes and start focusing on my breath. She would say to me, “Every time you inhale, imagine breathing in positive energy. Every time you exhale, imagine breathing out negative energy.” This is pranayama, this is the meeting of prana with apana, this is the expansion of prana and the reduction of apana. Through my practice of meditation, or dhyana, I am able to also experience pratyahara (sense withdrawl) and dharana (concentration), the four remaining limbs of yoga. One meditation experience in particular led me to a brief moment of Samadhi, or a superconscious state. It had been a very long and intensive week of traveling for work and I was on the second leg of my homeward journey. My body was inflamed from stress, exhaustion, and not practicing asana. My temper was short and I found myself on a delayed flight, stopped on the tarmac, with a screaming baby seated directly behind me. It felt like the ultimate test. Using the tools I learned from my studies of yoga, I began to focus on my breath. I started counting the lengths of my inhales and exhales starting from one and going to ten and then reversing the count. I have no idea how long I was sitting there counting and focusing on my breath but slowly the sound of the baby dissipated, my body relaxed, and for a brief instant, I was visited by the smiling, joyful Buddha. I was so shocked at the vision of his smiling face that I physically jumped in my seat. Of course, as soon as my concentration was distracted from my breath, the vision was gone. Through that one session of meditation I was able to calm both my angry temper and angry body and I was able to sleep comfortably for the rest of the flight home. 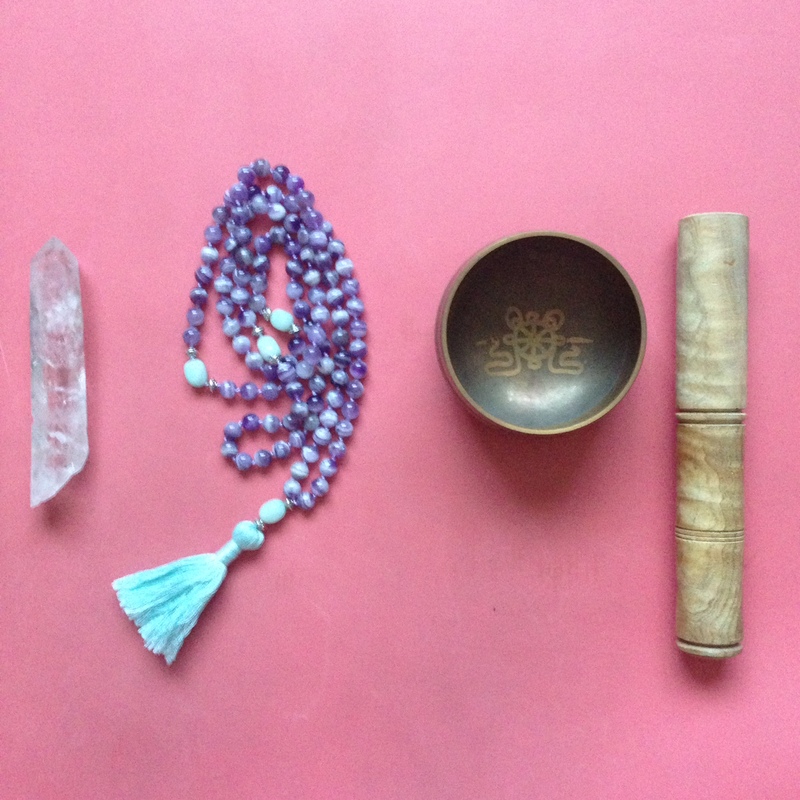 Quartz crystal, amethyst crystal mala beads, and my Tibetan singing bowl from India used during my meditation practice. Though the second of the yoga sutras defines yoga as the stilling of the mind, yoga is also commonly translated as union. By practicing the eight limbs of yoga, Astanga yoga, union of the mind, body, and spirit is attained leading to the union of the individual consciousness with the supreme consciousness. On a more personal level, yoga is also the union of all of the spiritual practices I have learned throughout my life. From the chakras and energy systems of the body, to the mindfulness, kindness, dedication and devotion taught by the yamas and niyamas, to the physical grounding of asana and pranayama, yoga combines these techniques for spiritual awakening and more peaceful living. In this way, I feel I have been unknowingly practicing yoga for nearly all my life. Perhaps this is why I feel so deeply drawn the practice of yoga. As I have studied, learned, and grown in these past two years of my dedicated yoga practice, my practice has changed drastically. Whereas I was once focused on achieving certain poses like handstand, I am now much more in tune with what my body and soul truly need. I practice the yamas and niyamas both on and off the mat and do not judge myself when I can’t get into an advanced asana or when I cannot even bring myself to my mat. I do not force a physical practice when my body is too tired; instead I practice ahimsa, satya, and meditation. Yoga has changed my life in so many ways that I never even dreamed possible and I am thrilled to continue my unique journey.